There are many box trucks for sale on the market, but only DePaula Chevrolet is able to offer world-class service when it comes to the sale, maintenance, and customization of these versatile working vehicles. You see them everywhere on the roads, either unmarked or with the logo of a business displayed proudly on the side. Whether it’s for a catering businesses or a moving company, box trucks are immensely helpful when it comes to getting the job done. Getting the job done is only one of the reasons why your business needs a box truck, and there’s plenty more ways it could benefit you if you make the switch — or keep using one. The design of a box truck is versatile, and so are the models DePaula Chevrolet is able to offer. With LCF (Low Forward Cab) Dry Freight models and a Express Cutaway 3500, you’ll find a box truck configuration that works for your business. Since box trucks have the space for interior shelves, it’s possible for business owners to store and transport more delicate materials, such as flowers, fruits, vegetables, or milk (milk bottles still exist in rural areas). A florist shop or farm that has a delivery business will most likely use a box truck for this reason, along with the fact it can protect the produce and milk bottles from hazardous elements such as rain, snow, wind, sand, etc. Catering companies heavily rely on box trucks for their businesses. The large and open cargo space provided allows caterers to transport the effective, yet bulky food-warming containers so their products stay hot for the ride. Also, it allows them to fit tables, chairs, coolers, or any other components they might need to cater an event. Again, shelving is an option for transporting food, but without the large amount of storage space, that wouldn’t be possible. Trade Contractors: Plumbing, HVAC, Electrical, etc. While some trade contractors in the plumbing, HVAC, and electrical fields use pickup trucks, more often than not you’ll see a box truck pull into the driveway when you call one of these businesses. Sure, pickups are able to provide their own unique forms of utility. But box trucks provide the business owner with much more storage space, and (again) a safe and secure way to transport cargo. Especially when transporting piping or other material that could cause serious harm to others if it’s not transported securely on the roadways. Safe and secure cargo isn’t the only benefit business owners glean from having a box truck. Check out the “Why Your Business Needs a Box Truck” section for a closer look at how else they can help better your business and boost your profits. Besides offering a safe and secure way to transport important cargo, there’s also plenty of other reasons why your business needs a box truck. If you’re driving a pickup truck, sometimes the bed doesn’t provide enough space, or maybe you need a way to keep materials dry. That’s where a closed trailer comes in, which hinders driving for some. Alternatively, you could throw a tonneau cover on the truck bed, but that detracts from your storage space. Since driving with a trailer is more of an art, especially when backing into a space, and has a lot to do with intuition — just like “swinging wide” to get a larger vehicle into a parking space — you’ll have to make sure your crew is comfortable driving with a trailer. On top of that, you’ll also have to make sure to maintain (whether yourself or through a mechanic) both a vehicle and a trailer, which is going to take up time that you could spend on the road. A box truck eliminates the need for a trailer altogether, and is much easier to drive and maintain than a truck and trailer combination. Trailers aren’t cheap, that’s a fact. When you buy a box truck to properly transport cargo, that’s all you need to spend money on, which is money you can save for various upfits or graphic (advertising) work on your box truck. Not only will a box truck save you money by taking the cost of a trailer out of the equation, but you’ll also have the potential to make more money since a box truck is also a great way to advertise. The more you get the name of your business or company out there, the more potential there is for attracting new customers and turning a profit, especially when it comes to contract work. It’s Business 101, and since box trucks have relatively flat, wide, and unadorned panels on the sides and back, you’re essentially looking at a rolling billboard. With the business logo positioned in all the right places, and the proper kind of graphics thrown on the box truck (which DePaula Chevy can make happen), you’ll have a huge advertising advantage over the competition that’s stuck with tiny door logos on a pickup truck. Clearly, box trucks are able to provide versatile services in many different types of jobs. This is why at DePaula Chevrolet, we make sure to provide consumers with a versatile lineup of box truck models. That way, you can find the right one for your business. With its cab over design, considerable length, and plenty of interior work space up front, the LCF with a Dry Freight design is a popular box truck choice. The cab over design ensures that drivers and passengers have optimal visibility, which is very helpful in busy cities. Apart from visibility, having a flat-front like that also makes it easier to drive in more crowded spaces. When you turn, you can precisely see where the front of your vehicle is. That flat design also makes access to the engine compartment a breeze, allowing for easy maintenance (if you do it yourself). The overall length of a LCF is quite considerable, but the storage space to passenger space ratio is even larger. The flat cab over design allocates more of the truck’s length to storage space. In the cab, you’ll find plenty of plenty of utility to keep your business running while you’re on the go. Fold-down trays that double as a laptop/work area, rear organizer tray, setback pockets, overhead shelving, and other convenient storage areas turn your LCF into a mobile office. The LCF comes in many different configurations, but with the Dry Freight box thrown on the back, it becomes a large and reliable box truck. With enough space to fit anything from pipes to industrial ACs and more. If you’re looking for something that isn’t as large as an LCF, an Express Cutaway 3500 with a box truck upfit on the back will do the trick. Thanks to the proven full-frame design of the Express 3500, it’s able to handle a lot of weight. With a possible best payload of 7,271 lbs. (the 4500 version boasts a maximum of 9,156) it can safely and securely carry anything and everything you might need. Powered by either a 4.8-liter V8, which returns 285 horsepower/295 lb.-ft. of torque engine, there is also an available a 6.0-liter V8 342 horsepower/373 lb.-ft. of torque engine. 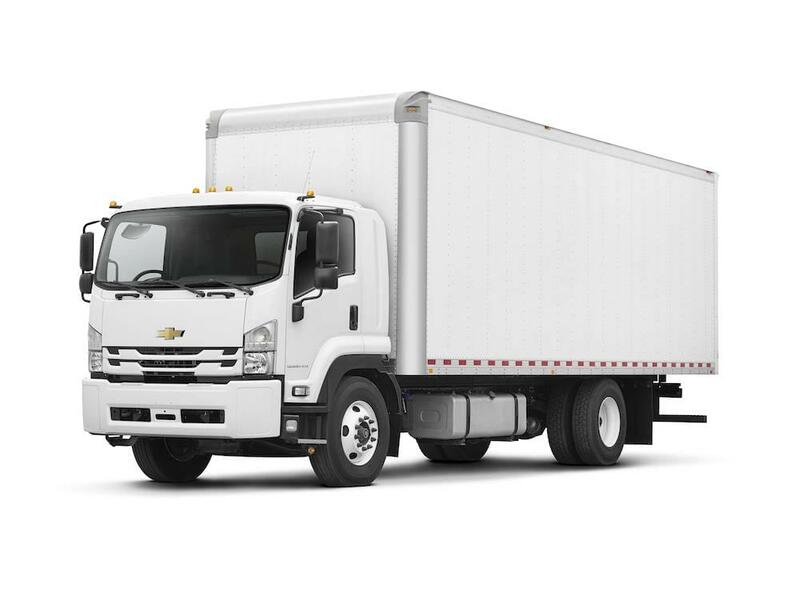 When it comes to commercial trucks in Albany, NY, you’ll find no better place than DePaula Chevrolet. We know commercial vehicles, and that allows us to not only order and install the upfits you want or need, but repair and maintain them as well. All you have to do is ask. Let us help your business by providing you with a high quality work truck today.